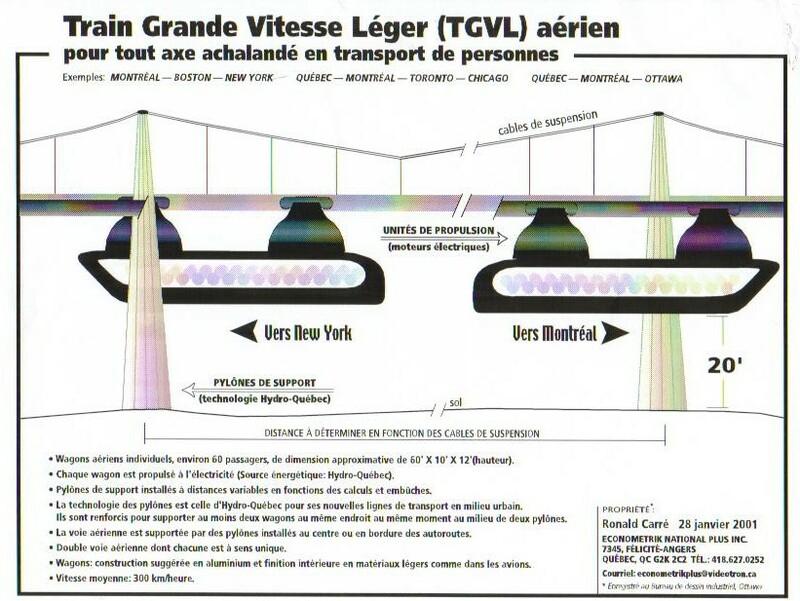 Train Grande Vitesse Léger ( TGVL) (Light High Speed Train) for a more efficient public transportation system across the North-East of America begining by the route QUEBEC«---»MONTREAL. To read the concept, click here. To visualise the drawing, click here. Large consortiums in engineering will continue, above all, to promote their ancient technologies before considering new ways as proposed here by Econometrik Plus. Nothing stops to make the true studies to demonstrate the economic faisability which are very inexpensive to do, above all if realised by economists specialised in quantitative economics. It is why we will have to do this to convince them. This simple message seems to be hard to understand for some people.